After immersing myself in the old city and cathedral of Cádiz yesterday, today I return to see if I can find more jewels in the city. And my choice of public transport this time is by bus. Given my past experiences with buses (see my Sanlúcar de Barrameda daytrip), I am prepared for a patient wait for my bus which duly turns up. It’s 3 Euros for the 40 minute journey which takes me past university buildings in Puerto Real. However, the bus doesn’t use the sleek modern bridge to Cádiz. But that simply means I am able to appreciate the elegant bridge over the sparkling blue water. I jump off by the Palacio de Congresos de Cádiz and make my way to Plaza de la Merced, to admire the striking red and white tower of the Mercy Parish (Parroquia de la Merced). Next I wander over to Plaza de San Juan de Dios. It’s a long fountained square. The striking 19th century neoclassical Ayuntamiento de Cádiz (Town Hall) is like a beautiful pendant at the end of it. In Cadiz’s heydays, this used to be a market square filled with exotic goods unloaded from ships arriving at the nearby port. I return to Plaza de la Catedral just behind the Ayuntamiento. 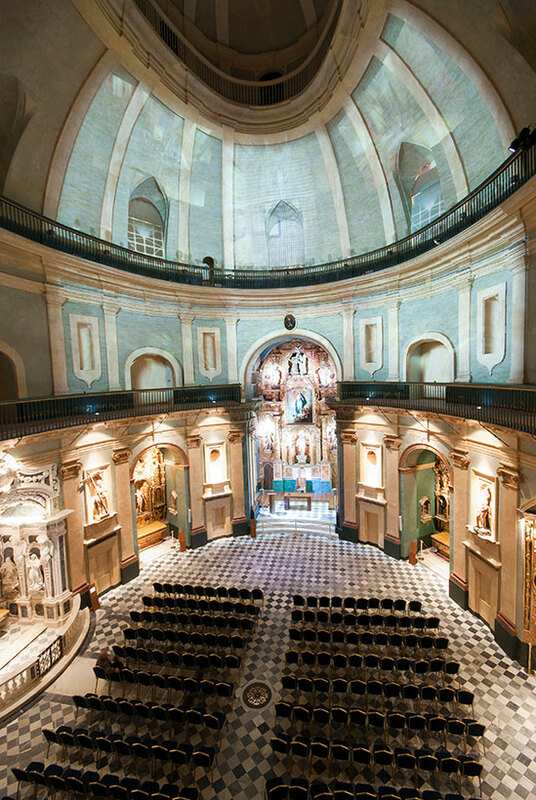 But today, I head to the Church of St James, rebuilt after the sacking of Cádiz in 1596. As luck would have it, I happen to be sat in the front pew when the gilded baroque altarpiece is bathed in hues of blue and silver, by spotlights which are just warming up. The next square is Plaza Flores. Just as the name suggests, I find several florists bringing a splash of colour to this square. Cádiz Central Market is next on the list. The building is a mixture of modern, Roman columns and wide aisles. And as expected, there is an abundance of fish, jamon, dried fruits, fresh fruit and vegetables. However it’s La Tahona, just outside the market, that catches my eye. I buy some delicious looking empanadas from its bakery for snacking on later. From the market, I make my way out to Av. Campo del Sur and the sea. I had read somewhere that the best view of the cathedral was along the beach where I was yesterday, close to the Iglesia Santa Maria. But I beg to differ. From this bit of Av. Campo del Sur, a memorable scene lies before me of the cathedral dome and towers, the tower of the Cathedral museum, the façade of the neoclassical Museo Casa de America and the sweeping bay. 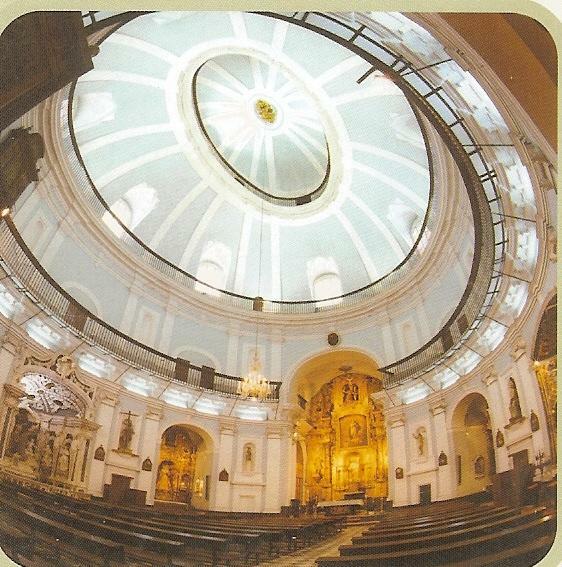 But its the Oratorio de San Felipe Neri (no photos allowed) that is the find of the day. Whilst the Cathedral may officially be described as the jewel of Cádiz, as an atheist, the Oratorio comes the closest to making me drop to my knees involuntarily as I look up at the incredible duck egg blue oval ceiling. (best image of ceiling I can find). If it was designed to make me feel like a tiny cog in somebody’s great plan for mankind, then it succeeds (best image of how small I feel). Every exquisite altar in this church is so different from the other (best picture of altars I can find). 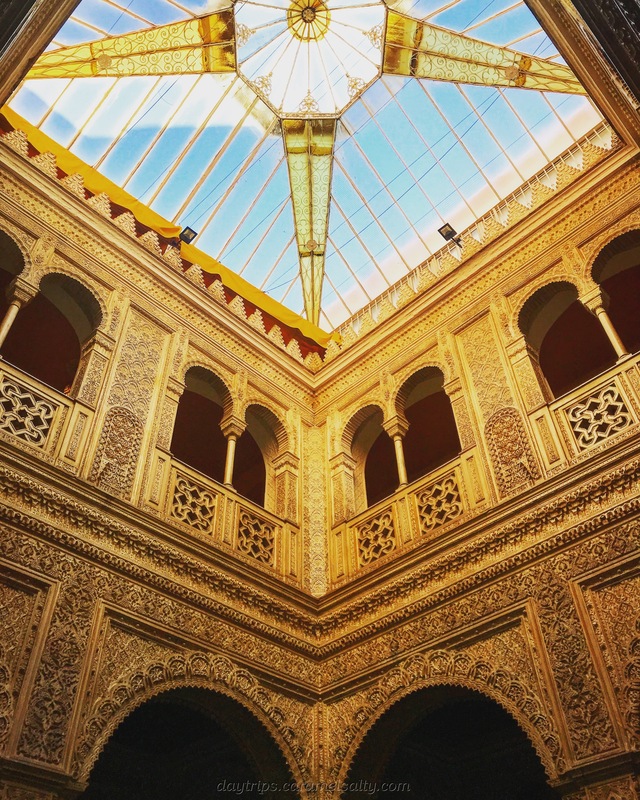 For me, this is a work of art, my jewel of Cádiz. When I eventually tear myself away from the Oratorio de San Felipe Neri, I end up at Plaza San Antonio, where I find the pretty pink façade of its namesake, the Parish of St. Anthony of Padua. However the star here is the Casino Gaditano. A mudejar style building, it’s now an upmarket restaurant, amongst other things. Gran Teatro Falla is another precious find. A gorgeous Mudejar style theatre on Plaza Falla (named after the chap buried at the cathedral). Unfortunately it’s nigh impossible to get inside without a ticket for a performance. I wander through what I think are the prettiest set of streets in Cádiz, the Calle Pastora and Calle Cuba. Furnished with pretty geranium filled blue flower pots, this is my ceramic trove of Cádiz. All treasure hunters must eat at some point. And so I settle at La Manteca. Friendly staff, cosy bar filled with bull fighting memorabilia, its not for the strict vegetarian. I enjoy the chiccarones and other meat and fish dishes for a good while. I have to walk my lunch off. So off to Playa Caleta I go, which features in James Bond’s Die Another Day with Pierce Brosnan and Halle Berry. A shame it wasn’t Diamonds are Forever. That would have worked so well for this blog. At the entrance to the long promontory to Castillo de San Sebastian, is a very popular restaurant, Juanito Villar Pena Flamenca. It is perfectly situated for a drink in the sun on the return journey back to land. As I enjoy a vino fino in the warm sunshine by La Caleta, I ponder the way back to the bus stop. Do I go back along the coastal Av. Campo del Sur to enjoy those fabulous views of the cathedral and bay again, or do I cut through the middle and find another sherry bar ? So many choices. But as I have so much time left, I do both, and in the process, remind myself of the treasure chest that is Cádiz. How to catch a bus – bus timetable here. Use the origen and destino option to get hold of the day’s schedule.